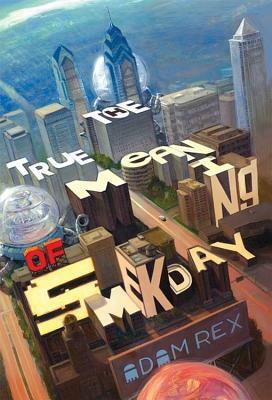 When twelve-year-old Gratuity ("Tip") Tucci is assigned to write five pages on "The True Meaning of Smekday" for the National Time Capsule contest, she's not sure where to begin. When her mom started telling everyone about the messages aliens were sending through a mole on the back of her neck? Maybe on Christmas Eve, when huge, bizarre spaceships descended on the Earth and the aliens-called Boov-abducted her mother? Or when the Boov declared Earth a colony, renamed it "Smekland" (in honor of glorious Captain Smek), and forced all Americans to relocate to Florida via rocketpod? In any case, Gratuity's story is much, much bigger than the assignment. It involves her unlikely friendship with a renegade Boov mechanic named J.Lo. ; a futile journey south to find Gratuity's mother at the Happy Mouse Kingdom; a cross-country road trip in a hovercar called Slushious; and an outrageous plan to save the Earth from yet another alien invasion. Fully illustrated with "photos," drawings, newspaper clippings, and comics sequences, this is a hilarious, perceptive, genre-bending novel from best-selling author Adam Rex. Adam Rex is the New York Times best-selling author and illustrator of Frankenstein Makes A Sandwich. His other books include Pssst!, Moonday, The True Meaning of Smekday, Fat Vampire, and Cold Cereal. He also illustrated the Brixton Brothers series, Billy Twitters and his Blue Whale Problem, and Chloe and the Lion, all by Mac Barnett and Chu's Day by Neil Gaiman. He lives in Tucson, Arizona. Visit him at adamrex.com or follow him on Twitter @MrAdamRex.